Each arrow indicates an antenna, with the arrow heads indicating directions. 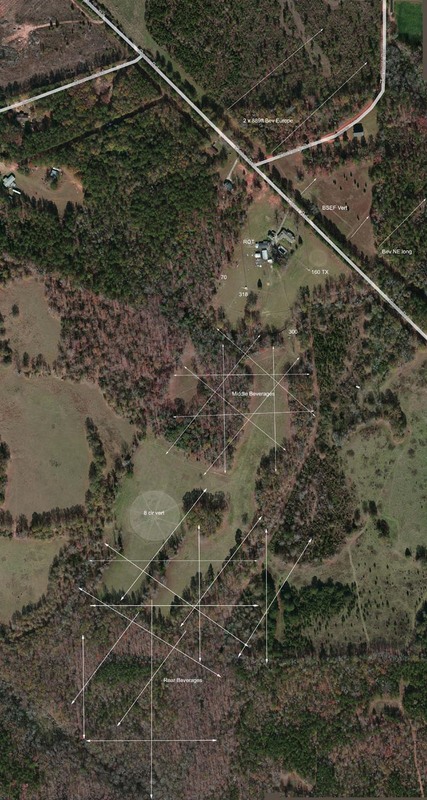 When multiple arrows are parallel, the antenna is an array of all antennas. For example, if you look southeast of the 8 circle vertical (160M), you will see three arrows going NE and SW. This array is three 880-ft Beverages about 330 feet apart, fed broadside with a 1:2:1 current ratio for minimal side lobes. Also shown above are towers, with number designations for height except 160 TX, which is a ~200 foot vertical for omni and four wire elements to form an eight direction 4 square antenna, and ROT which is the ~200ft rotating tower. Small verticals, and a 4 square for 40 meters, are not marked. Conventional Beverage's ~580 feet long. Currently only two left, reversible, far in the rear. They can be used for higher bands, reference comparisons, or for spotting purposes. Maintenance of the conventional antennas is somewhat erratic, since they are rarely used. Arrays of Broadside Beverages 780-880 feet by 350 feet broadside spacing. Currently two similar systems spaced ~1000 feet apart, with antennas E, SE, S, SW, W, and NW (28 individual Beverages make up this system). For NE, a primary contest direction, the rear Beverage is three 880-foot Beverages spaced 300-feet between antennas, combined in a 1:2:1 current distribution. The front Beverage is two Beverages 880-feet long and 350 feet broadside, combined. A secondary single Beverage 800-feet long is on Europe for 80 meters and higher. Distance from rear Beverage to front Beverage is somewhere around 1/2 mile, allowing for spatial diversity in stereo. Reversible for ZL/South Pacific, default on Europe. This array covers eight directions, spaced every 45 degrees around the compass. It has 22-foot tall top and base loaded elements. Over 1/4 mile of 75-ohm cable is used in this array (and 2500 feet of cable to reach the house). Each antenna element is made from 1-1/2 inch chain link fence top rail. The fence rail hinges on these wooden posts with a bolt through the bottom of the vertical rail. 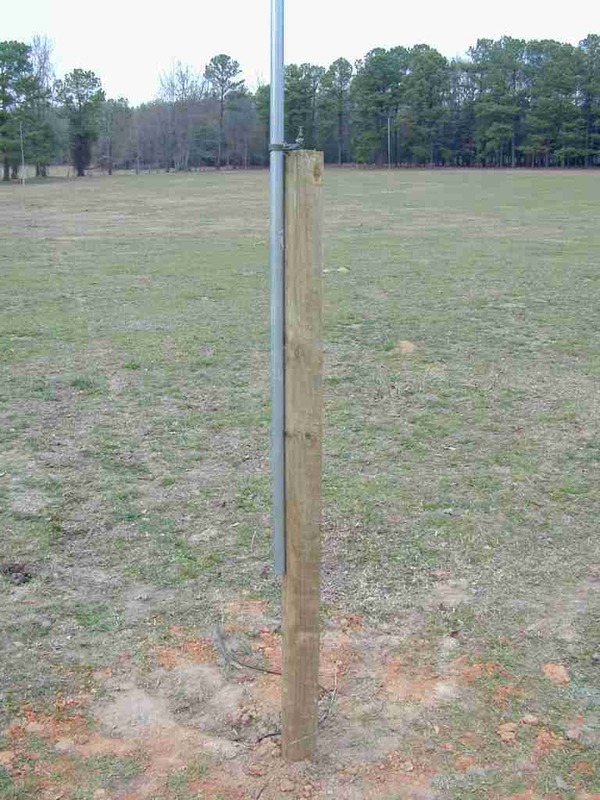 The top of the wooden post has a steel pin that fits in a hole in the metal railing, and it is lashed in place. All compass directions. Electrically rotatable. I use one central entrance point, located in the house, for all receiving cables. This is the single point where all equipment and cables inside the house ground. 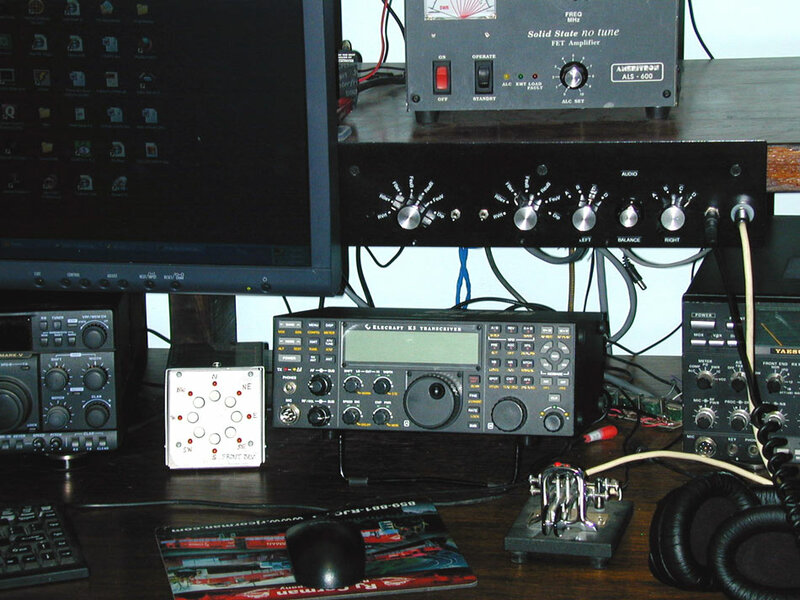 Unless required for power or electrical safety, there are no grounds to equipment on my desk. This is my "wire hider" box. All amplification is in the house. Amplification outside actually decreases dynamic range. There are three permanent direction antennas, all northeast for Europe, available at any time, regardless of any other antenna being used. 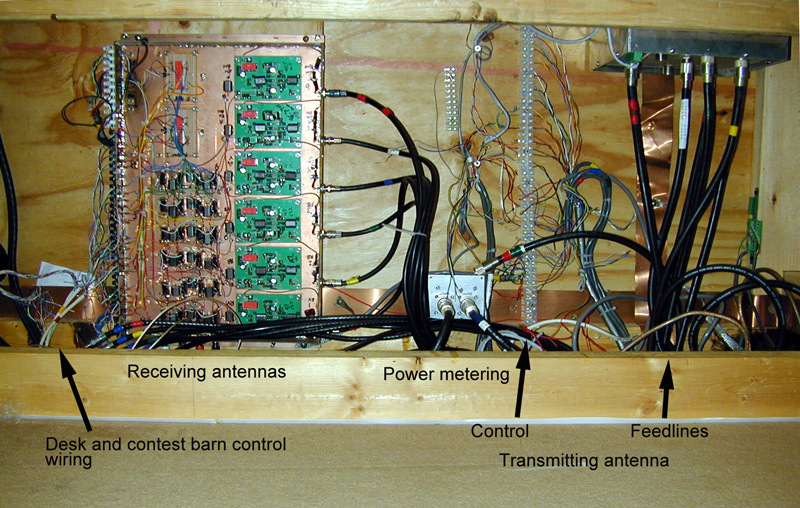 Note that all antennas enter the matrix through connectors mounted on the copper wall of the receiver switching system. This forms the common ground point. Further, you will see the outside entrance common grounding point, just on the outside of the wall behind my "wire hider" box. This is similar to my Contest Barn setups. The two right side switches select the audio input and ear for headphones. Any ear can be placed on any receiver. The balance control sums L and R audio to a mono speaker amplifier. The two left-side rotary switches chose the array group desired, while the silver box on the table picks direction of that group. This house entrance is common grounded to the inside shack common ground point. This is a double-barrier single-ground system. 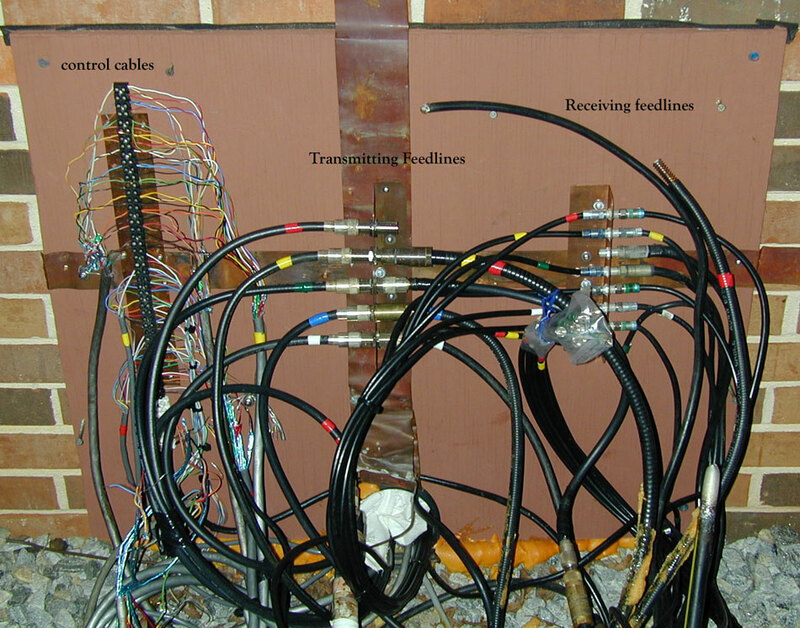 This is also a test point, where terminations are applied to replace external feed lines, for in-shack noise. My equipment is dead quiet with terminations at this point.